Hideo Kojima, creator of the Metal Gear franchise, has many stories to tell about his experience with the PlayStation over the past two decades. He was kind enough to share a few of them. "I was in Kobe, and it was in 1993 when the precursor to Kojima Productions, Kaihatsu Gobu (開発5部 trans: Development Section 5), was formed." Kojima recalled in an interview with Weekly Famitsu. "The original PlayStation was released the next year and I remember it well because the section had just been formed." Right from his initial encounter with the new console, Kojima knew he wanted his next Metal Gear game on it. 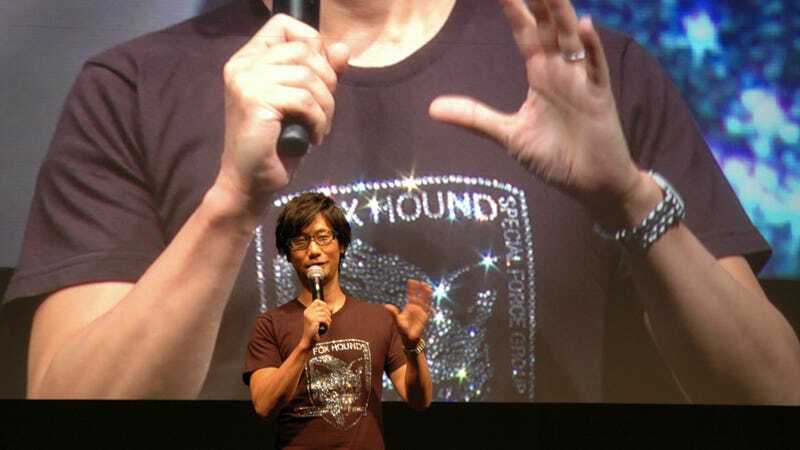 Said Kojima, "3D games using polygons had just started coming out in arcades, and I had thought that the hurdle to release such a home console was too high, so when I saw the specs, I found myself shaking. At the same time, I immediately knew that 'If I make a Metal Gear game on this console, it'll be amazing.'" At the time of the original PlayStation's launch, Kojima was working on the game Policenauts for the PC. Even so, his eyes were set on the new console. "I promised myself, 'I'm going to make Metal Gear [for the PlayStation]' so I asked Yoji Shinkawa to design the prototype for Metal Gear REX and other things in preparation." Kojima said. It was when Policenauts was ported to the PlayStation that Kojima began his relationship with the console. However, the journey was not without its initial stumbling stones. Unlike with PC games at the time, hardware makers for consoles would conduct bug checks and rate the games released on their systems, leading to a rather interesting episode in regards to the Policenauts port. "I was contacted by [Sony Computer Entertainment], who told me, 'We're going to decide in an upcoming meeting how many times breasts can jiggle.' I argued over and over with them saying, 'that's absurd!'" Kojima laughed. "In the end, we worked things out, but I'll never forget arguing over the 'breast jiggle issue' with Shuhei Yoshida, who was our SCE contact at the time." Metal Gear Solid was released in 1998 and made waves, but as revolutionary as the game was, Kojima realized that he wasn't the only creative mind out there and that there were others who were just as, if not more creative. "At the time, there still wasn't a 3D polygon game that allowed you to move the camera around in realtime. So I created a 50 cubic meter space, added some enemies, and tested it by having a viewpoint through a sniper rifle scope." Kojima recalled. "It was really fun and I thought to myself, 'it would be great if I made a game with this,' but Tomb Raider beat me to it. That was when I felt the threat that 'foreign studios are really good.'" For Kojima, the PlayStation offered much potential in what kind of games could be made. But even more than that, one unexpected result of working with Sony was how the perception of game creators changed. "I believe that the game business changed greatly because SCE treated those of us who made games as 'creators.'" Kojima explained. "We would have our pictures in articles as though we were artists, and there were parties for us. Game developers who never really cared what they wore until then began caring about their looks. It really felt like the game business had moved up in the world." One episode Kojima recalled happened shortly after the release of the original Metal Gear Solid. "I was suddenly summoned by Mr. Ken Kutaragi. And he said to me, 'the PlayStation 2 is coming out.'" Kojima said. "Then he handed me a development board [for the PS2] – one of only a few in existence – and said, 'Mr. Kojima, please take this with you.'" Information on the PlayStation 2 was a massive corporate secret, so, after bringing the board back to his office, Kojima barred off his editing room and shut in one programmer to test the board out for nearly 3 days. Kojima is currently working on his latest addition to the Metal Gear saga, Metal Gear Solid V: The Phantom Pain, set for release next year on the PlayStation 4 and PlayStation 3, as well as the Xbox One and Xbox 360. While he may have branched out to other platforms, he still retains a long history with the PlayStation brand. "I feel I can relate to Sony, a company that was built up by engineers, and I hope that I can continue walking with them in the future."